A particular solution for any nonhomogeneous linear second, third, and fourth order ordinary differential equation is generally determined. Applying what was determined thus; and following by example a particular solution formula for arbitrary order is obtained. Finding a particular solutions to a linear nonhomogeneous ordinary differential equation has always been a process of determining homogeneous solutions, and then adding any particular solution of the nonhomogeneous equation. The well-known methods of undetermined coefficients and variation of parameters have long been the standard in determining this particular solution. The former has sometimes been considered 'ad-hoc', and both can be intricate. A relatively simple formula has been found which allows the particular solution to be written and evaluated immediately. 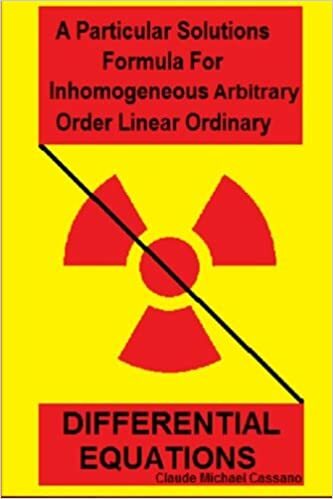 CLAUDE MICHAEL CASSANO (2017), "A Particular Solutions Formula For Inhomogeneous Arbitrary Order Linear Ordinary Differential Equations," https://simiode.org/resources/3581.